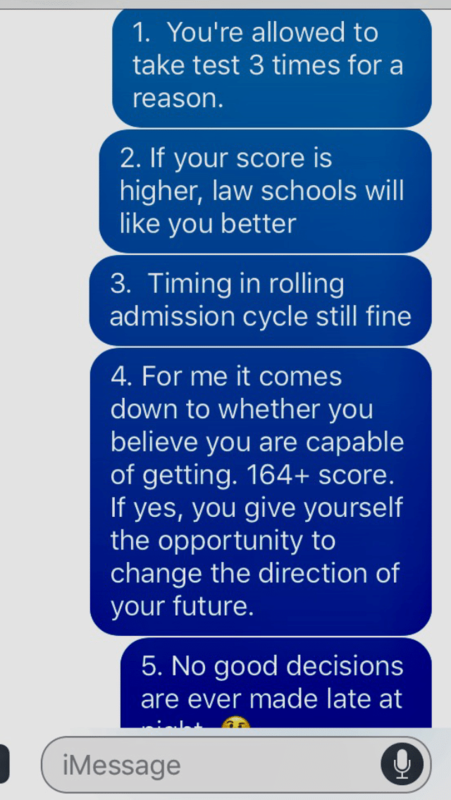 A client texted me last night after LSAT scores came out. He received an LSAT score of 160, which was significantly lower than his practice tests (169-172). It was only his second time taking the test, yet he said he was ready to move forward and apply. It’s worth waiting 6 weeks to be more competitive for both the schools you’re interested in as well as scholarships you might qualify for. Why compromise? If you apply now, with the 160, you’ll never be happy with your results. You’ll feel you left an opportunity on the table. Why? Because some anonymous fellow applicants on a forum said so? Give yourself the best possible chance to succeed. Ann, I have a question about the February LSAT. I would appreciate if you could give me some advice. Thanks in advance for your help and your excellent blog. I currently have a LSAT score, which is in the high 160s. I am considering whether I should retake in February 2017 for the current cycle. My questions are: if I submit my application to a school in the following days, will the schools know my February registration from LSAC or any other sources? If so, during the period from the school receiving my application to it receiving my February score, will the February registration in any way hurt my admissions prospects (e.g. the school holding off reviewing my application until the February score release, the school suspecting that I am trying to go to higher-ranked schools)? And finally, after the February test score release, if I get a lower score (or choose to cancel the test score), will that hurt my admissions chances? David, I would probably tell you to withdraw from Feb and apply now with your current scores but it’s hard to say without knowing more about your qualifications and which schools you’re targeting. It’s very hard to be competitive at top schools with a February LSAT because by the time your application is reviewed, the schools have admitted enough people to fill their classes and already have waiting lists. Quick question re the 164 threshold you cite in the screenshot of your post. Is that number specifically geared toward the applicant’s starting point of 160 (i.e. exceeding 163 given an increase of up to 3 points is not considered statistically significant per LSAC)? Or do you view 164 as an independent threshold that will still get you a cursory look at any school in the nation (although below 25th percentile of the top 6)? Aim for a 170 or higher on the LSAT. You will need it. Only people graduating from the best law schools are getting jobs these days. I would definitely re-take if you can’t get 170 or higher. Say you graduate with a 3.37 GPA and have a 170 LSAT score is it impossible to get into a top 14 school. If your an athlete and get a graduate degree. say you have a 151 lsat and a pretty low gpa of a 2.9 or 3.0. I had a lot of struggles throughout highschool and college but I have been trying really hard. I had multiple internships at law firms and was very active in my community. Do I have a chance at all? I am not looking at 1st or 2nd tier school. I am more interested in John Marshall, Depaul, anything in Illinois, wisconsin or Michigan really. Should I retake the LSAT in september or just apply? All my previous internship bosses, as well as my volunteering mentors are all willing to offer any help and give me letters of recommendation. you said retake it. The higher the score the better opportunities you will get. Adam, No reason to wait until next cycle. When you get your score, just go ahead and apply. I graduated a 3.66 (spanish major, pre-law minor) and took the lsat in October and got a 159. I just took it again today and I’m not sure I did much better. Maybe a 160 or 161. My practice scores are always around 165 or so. Is it bad if I take it again in February? I’m applying to ASU and U of A and that’s it. And if I do take it again in Feb should I still go ahead and apply now? (I have worked two days a week at a law firm, unpaid, for the last year, and hopefully that will help my chances of acceptance). I got a 153 June LSAT & 157 Dec LSAT. I underscored on LG big time. Ultimately, I’d like to work for self vs a law firm but am worried about scholarships and competitiveness. My GPA is 3.4. Should I retake the LSAT in Feb? Hi Elle, it’s hard to be competitive for scholarships with a February/March application. It’s late in the cycle and most of the funds have been distributed. 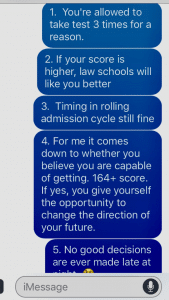 It would be better to improve your LSAT and apply early in next cycle. Depending on your schools, though, your current score will get you scholarships to some schools. Hi, I got a 156 and 157 on June and Dec lsats. But I was consistently getting 165-167 in my practice tests. Should I wait till next cycle, and retake it? Cause I really need scholarships and would like to get into a top 30 school. HI, I got 156 and 157 on the June and dec lsats. My gpa isn’t exceptional either (3.57). However, I really need scholarships and would really like to get into a top 30 school. Do you think I should wait till the next cycle to apply and retake the lsat? I’m currently working full time but a law firm. Thank you! Sorry I’m just seeing this now. What did you end up doing? I’ve taken the LSAT three times now with a score of 141,149, and then 150. I was planning on taking the test again in November since it’ll be over two years since I got the first score. The schools I want all want at least 155 which I think is attainable with more practice. Should I take the test for the fourth time or go with one of the schools who would accept me with the current score and look into transferring after the first year? Rachel, if you think a 155 is attainable – go for it! I’ve heard from multiple sources that taking the LSAT more than once is not ideal at all. I did not know this information when I took the test in February and didn’t score anywhere near what I wanted. I’m currently enrolled in a 2-month intensive prep course to take it again in September. I’m still not scoring where I want to, and I’m wondering if I should go ahead and take it in September or if I should just push it back to November? I really want to apply this term since I am already taking a year off and I’d like to maximize my chances of getting in and perhaps getting a scholarship, which is why I wanted to apply as early as September/October. Would you advise me to go ahead and take the test in September, and apply, and worse case re-take it again in November if need be? Would taking the LSAT three times look worse when I apply to schools vs just sticking to the score I’d get in September and applying with that? Define “Ideal”. Ideal – who actually WANTS to take this test more than once. We’re not focusing on IDEAL. We’re focusing on the best long term decision for YOU. Take the LSATS as many times as it takes to the the score that best represents your abilities. If you need to retake in November, it’s no big deal! I got a 165 the first time i took the LSAT, and a 168 the second time. I consistently score between 172-175 on practice tests (both times i choked on RC in the pressure of the exam). I have a 3.9 GPA and am aiming for top law schools. Should i retake the exam in September for a 3rd time (which I’ve heard is bad) for the elusive 170+ or submit my application as is? Caitlin. Take it again! It’s not “bad” – that’s so judgmental! You’d still be applying early in the cycle. Get the best score you can and your practice scores indicate room for growth. I’m trying to get into a Top 14/Top 5 law school. I have a GPA of 3.86, but have gotten LSAT scores of 162 and 165. I have been scoring in the 168-172 range in practice tests, so I’m debating signing up for the November test, but I’m worried applying in mid December may hurt me. I took the test a year ago, and got a 149, when I was getting low 150s on the practice tests. I went and got a master’s degree. I took it again this September and was getting 151-155 on the practice tests, but choked during the test and got a 145. Will my application be late if I take the November LSAT and turn it in as soon as I get the results in December? I am aiming for a mid level school, I have a 3.5 and have a few legal internships on my resume. I also really think I am just terrible at taking standardized tests. I don’t know if it is better to turn it in early or risk scoring badly a third time on top of sending it in my applications late. I got a 163 on the June 2017 test and just retook in Sept and got a 158. I was consistently scoring between 164-167 on the practice tests I took before the test. Wondering if I should take it again in November to apply this cycle or look into taking a course and applying next cycle. Don’t know how bad it looks dropping so much between tests. So sorry I didn’t see this earlier. I am trying to get into a top 14/top 5. I have a 3.86 gpa but have gotten a 162 and 165 on previous LSAT’s. I’m debating signing up for the November LSAT (I’ve been scoring 168-172 on practice tests) but I’m the November test will put me too late in the cycle. Thanks for the help and great site! Hi CH, sorry I didn’t see this earlier. November does not put you too late in the cycle. I took the LSAT in June and got a TERRIBLE score of 145. Would it be in my best interest to register for BOTH the November and January tests or just study hard for January? I want to give myself the chance to do exceptionally well, but is taking the test 3 times a bad thing to law schools? – Sorry I didn’t see this earlier! It’s not bad to take the test 3 times. But it is not great to apply late in the cycle with a January score, so just keep that in mind. I took the LSAT for the first time in November and got a terrible score of 140. I pretty much know that the reason I am scoring so low is because I am running out of time at the end of each section and guessing on at least 5 questions. I wanted to have a decent score to apply for fall 2019, but I am not sure if I can obtain one if I take the January LSAT, due to shortage of time. Is a little over a month enough time to bring my score to about a 150, or is it too risky taking into account other factors such as applying late, scholarships, etc. I have taken the LSAT twice now, scoring pretty low, 144, 149 (June/Nov) I am considering taking it again to bump into the 150s. The schools I’d like to apply to are much more realistic once I reach the 150s. Will it completely ruin my chances to take the January LSAT? My thought process was that I’d have more of a chance in Feb with a higher LSAT score vs. applying early with a lower LSAT score. Is that a safe assumption? Or should I take my chances applying now? I have taken the LSAT twice now, scoring pretty low, 144, 149 (June/Nov) I am considering taking it again to bump into the 150s. The schools I’d like to apply to are much more realistic once I reach the 150s. Will it completely ruin my chances to take the January LSAT? My thought process was that I’d have more of a chance in Feb with a higher LSAT score vs. applying early with a lower LSAT score. Is that a safe assumption? Or should I take my chances applying now? I have to decide quickly as the deadline for the Jan LSAT is coming up. Abby, the difference between a 149 and 150 wouldn’t be worth waiting for, but a 153-155 might be! I am trying to decide if I should retake the LSAT and skip this application cycle. I scored a 149 on the June LSAT and a 150 in November. I took a class, studied hard, and was scoring around a 154-159 in the months leading up to the November LSAT. I really don’t know what happened. I have a 3.64 gpa and law firm work experience, if that helps. Some of my top choices for law schools was U San Diego, Loyola Chicago, and William and Mary. See what happens this cycle and if you’re not happy with the result, take the LSAT again this summer and apply early in the fall. Hi Ann, I took the September lsat and scored a 152 because I choked. Since then I have been scoring within the 160-165 range but I am super variable. I don’t know whether to postpone the January test and take it in March instead and I am also running out of material. If I’m being honest, I am nervous to use my second attempt because I scored so low the last time. Should i take it in January? Or should I postpone it until March? It’s difficult because i am running out of material. Do law schools really look that negatively upon three attempts? Also I am applying next fall. If you’re applying in the fall, you can take the LSAT both times!!! Do what you need to do to get the right score for you! I took the LSAT in September and scored a 158, and again in November and got a 156. My practice tests were in the mid-160 range. I’m not particularly happy with my scores and am contemplating taking it again, but I’m worried that taking it three times would look poorly to schools, or worse, risk doing worse. I’d be happy going to any of the top 40 schools. Grace, if you can get in the mid-160s, you should retake the test.